First phase of Amdjarass Wind Farm is complete, second is underway. 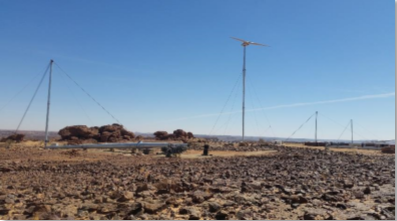 Project is in East Chad and consists of four GEV MP 275kW turbines and Hybrid Wizard™. Amdjarass is set to become first city in Chad to be 100% powered by renewables. The first phase of Vergnet’s Amdjarass wind farm project in Chad was completed in February 2016 and work has begun on the second phase with commissioning of the wind farm due in December 2016. The Amdjarass wind farm is located in the East of Chad and consists of four GEV MP 275kW turbines which supply electricity to the city of Amdjarass. Phase one of the project involved the supply and installation of four Vergnet turbines. Phase two, the electrification phase, is currently underway and consists of installing energy storage, two generators and a transmission line. During the second phase the wind farm will be combined with a large capacity ESS (Energy Storage System). The grid will utilise Vergnet’s Hybrid Wizard™ which will maximise fuel savings in the remote region by allowing the diesel generators to be switched off during extended periods of time and ensuring a secure energy supply. When the project has been completed, Amdjarass will become the first city in Chad to be fully powered by renewable energy. The gird forming tool took three years of research to create and this will be the first project to utilise the technology. Amdjarass wind farm has been developed in line with the grid operators to improve the quality, availability and economic performance of its renewable energy plants. With over 25 years’ experience working in challenging and remote locations, Vergnet has many successful projects across the globe. One of Vergnet’s project in Africa is the biggest wind farm in sub-Saharan Africa to date, located in Ashegoda, generating 120 MW of power.